Mimi Farfan is 15-1 with an ERA of 0.37 for Calvary Christian Academy. 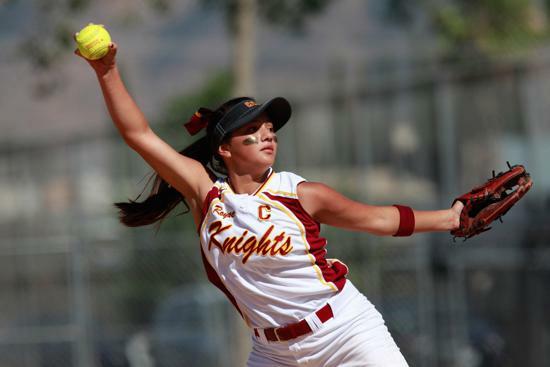 CHULA VISTA  When record-setting freshman Noemi “Mimi” Farfan reached high school, she really wanted to play softball; she’s played it for seven years already in recreation and travel-ball leagues. The problem was that Calvary Christian Academy, a school of barely 100 students at the high school level, hadn’t been able to fill a team in two years. Mimi went to work; first lining up her father, Joaquin, a former head baseball and softball assistant coach at the tiny K-12 Christian school in east Chula Vista, as head coach. She found senior Kailey Harvey, a member of the school’s last team, dying to play as well and her father, Craige, willing to be an assistant. Together Mimi and Kailey started a petition to restart the team. Then they went out to find players. “We went door-to-door to every high school classroom,” said Mimi, who already lettered in volleyball and basketball and this spring also runs sprints for the school track team. What they didn’t expect was how quickly Joaquin would mold them into winners. The Knights (16-1 at press time) won their first 14 games by an average of 16-2. “Not in my wildest dreams did I think we would come out 14-0,” admitted Joaquin. Not even the heartbreaking 5-4 eight-inning loss to Borrego Springs can spoil what the Knights accomplished, including a credible claim to the top seed in the upcoming San Diego Section Division 5 playoffs. There are two major reasons for the team’s success and both are named Farfan. The first key to winning in softball is pitching, and Mimi is an outstanding pitcher with a five-pitch repertoire — fastball, change-up, spinner (which acts like a screwball), curve and riser. “I know how to pitch and how to throw strikes so I knew we could win if our girls could keep improving to hit and back me up,” said Mimi. Knowing how to pitch is an understatement. Mimi is 15-1 with an ERA of 0.37. She’s averaging two strike-outs per inning. Her total of 205 Ks in 76.2 innings includes a season-high 21 in the Knights’ loss to Borrego Springs. She shut out Borrego earlier in the season but fell victim to timely Ram hitting and her own team’s defensive lapses. As for her offense, there are not many hitters like her in Division 5, or the section for that matter. Through last week, she was batting .774 with six home runs, 21 doubles and 74 RBIs. She is also perfect in 47 stolen base attempts and hasn’t committed an error or struck out. With two games remaining, Mimi has claimed one section record, is about to break another and within striking distance of the highest batting average in section history. Her 74 RBIs are just one behind the section record of 75 in 1992 held by Holtville’s Alison Peckham. Mimi has already soared past the section record of 19 doubles, held by Peckham in 1991 and Kaelin Sprawls of Palo Verde in 2011. She is in range of the all-time best batting average of .789 by Kelly Majam of Mountain Empire in 2008. “It’s what both my dad and I expect,” said Mimi. Joaquin has coached teams at every level. He’s just finishing coaching a Bonita Valley Softball League rec ball team and is starting to coach that league’s 10-and-under Gold All-Stars. At Calvary Christian, with the number of inexperienced players, he focuses on the same basics. “I work the majority of time with the same drills I do with my 10U teams,” he said. So how far can this team including eight freshmen go? “I honestly think we could win the whole thing,” he said.